I love my heart rate monitor watch. I use it at the gym everyday to monitor my personal calorie burn. It is so motivational to see how many calories I can burn in any given workout and it helps me to monitor when I can push myself harder. Many times the calorie counts on the machines at the gym are not accurate and give you a false idea of the true number of calories burned. Heart rate monitors can be extremely expensive. 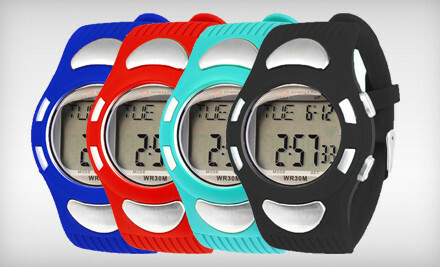 Today’s deal is awesome, For just $10, you can get a Bowflex EZ Pro Heart Rate Monitor Watch in your choice of nine colors. It’s also a stopwatch, alarm clock, and day-of-the-week calendar – perfect for tracking it all! Go HERE for full details and to purchase yours while they last. How does it count calories? I don’t see that option on mine?